Not finding what you're looking for? Please contact the store directly and we'll be happy to assist you. Named a Best Book by Entertainment Weekly, O Magazine, Goodreads, Southern Living, Outside Magazine, Oprah.com, HelloGiggles, Parade, Fodor’s Travel, Sioux City Journal, Read it Forward, Medium.com, and NPR’s All Things Considered. In the spring of 1885, seventeen-year-old Jessilyn Harney finds herself orphaned and alone on her family's homestead. Desperate to fend off starvation and predatory neighbors, she cuts off her hair, binds her chest, saddles her beloved mare, and sets off across the mountains to find her outlaw brother Noah and bring him home. A talented sharpshooter herself, Jess's quest lands her in the employ of the territory's violent, capricious Governor, whose militia is also hunting Noah--dead or alive. Wrestling with her brother's outlaw identity, and haunted by questions about her own, Jess must outmaneuver those who underestimate her, ultimately rising to become a hero in her own right. 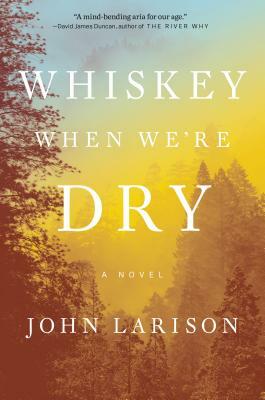 Told in Jess's wholly original and unforgettable voice, Whiskey When We're Dry is a stunning achievement, an epic as expansive as America itself--and a reckoning with the myths that are entwined with our history. John Larison spent much of his childhood in remote regions of Australia, the Caribbean, Canada, the South Pacific, Alaska, and the American West before graduating from high school in Ithaca, New York. He studied philosophy and literature at the University of Oregon, and became a renowned fly-fishing guide ahead of earning an MFA from Oregon State University, where he stayed to teach while writing Whiskey When We’re Dry. He lives with his family in rural Oregon. Enjoy FREE shipping on books (5 - 10 day delivery) or pay just $5 for 1 - 3 day delivery on ALL ITEMS. SUN - THUR 10 A.M. - 6 P.M.
FRI - SAT 10 A.M. - 8 P.M. Copyright © 2017 Word after Word Books Inc.